I do like wearing colour, but every so often I like to join my fellow Melbourne brethren and don an all black outfit. This black “Venice” dress from Eliza Parker‘s a pleasure to wear – it has a draped surplice bodice which I had to pin for modesty’s sake but was an instant hit with the Sophisticate. The removable sash can be subbed out for something else for a splash of colour, and the whole piece is constructed with Eliza Parker‘s usual excellent quality. It’s made of a heavy poly-spandex jersey and is fully lined, which means that it’s fabulously comfortable, but gives a smooth line too. It does seem a smidge smaller than my other Eliza Parker pieces, particularly in the arms – or maybe carrying around my huge new Hardie Grant kit has just given me buff arms! Teamed with fun polkadot stockings from Basque’s plus range of hoisery for just a little bit of whimsy and I feel quite at home on the streets in amongst the other black-clad Melburnians. 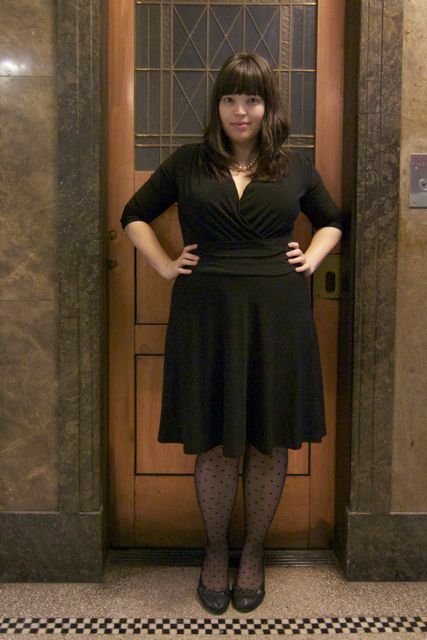 This entry was posted in Uncategorized and tagged cold, dress, eliza parker, wittner by lillipilli. Bookmark the permalink. This is exactly the kind of dress I’ve been looking for!! Shame it’s so expensive…but I guess you have to pay for good quality items. I might just try and save up for it. You look fab, by the way, the dress fits you like a dream! Thanks LittleMissPlump! Keep an eye peeled on the Eliza Parker twitter feed because they do special discount offers with great regularity. Just discovered your blog from Already Pretty. I’m loving your style. Thanks for the great outfit ideas! My absolute pleasure! I’m glad you’re enjoying reading! I require that dress, in my wardrobe, as soon as possible. It is AMAZING! It’s such a lovely piece to wear too! Snap it up, I say! 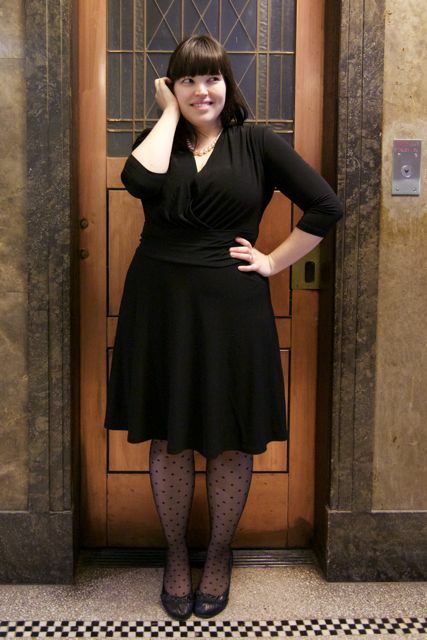 nothing like a black jersey dress, really! I have sent a few people to your blog for style-spiration, they love you! I too like a little bit of color but sometimes it is nice to wear black! Simple and stylish black! This is a gorgeous dress on you-love it! Thanks Rochelle! Tres classy, I thought! Naw, I’m too shy about my knees! Lilli, please try not to be shy about something that is a part of you and unchangeable – You are a beautiful woman who inspires many other women to feel good and love themselves however they are, whatever body type they have. I know for myself you’ve inspired the heck out of my clothing choices, and I feel good when I walk out the door to face the world, rather than trying to apologise about who I am/how I look. Well, all I’m trying to say is you deserve to love yourself because you are loved by those close to you in your life, and admired by many who you share parts of your life with online, and knees are one of those things that you can’t change, and shouldn’t apologise for, so, maybe finding courage to love your knees might open up a whole new fashion dominion for you to completely rock! >_> Hope I haven’t overstepped myself. stay awesome Lilli. Lilli, you look stunning in this! True colour is fantastic but sometimes nothing is quite as bold and classy as black (spoken like a true Melbournian I know!). This dress suits you perfectly, I have to agree with the Sophistocate you’re a hottie and I’m sure you’ll get plenty of use out of such a lovely dress. totes could team it with an obi-inspired belt for some colour. This is just lovely, I was thinking about whether to treat myself to my third Eliza Parker dress, and I think you may have just swayed me in the right direction. That looks gorgeous on! 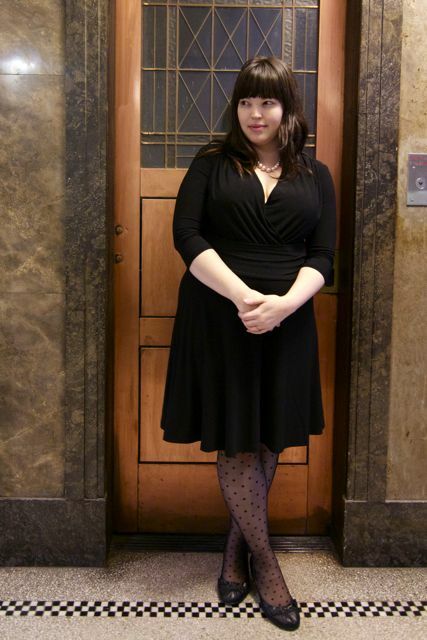 I love the shape and style of the dress, all the stuff you wear from Eliza Parker looks beautifully made. I am tempted to save and purchase something – any recommendations?